Mkts recover on value buying. Stock markets bounced back from their one-year lows and ended in positive zone, driven by bargain hunting and rebound in global markets. Mumbai: Stock markets bounced back from their one-year lows and ended in positive zone, driven by bargain hunting and rebound in global markets. Ending a three-day losing streak, the benchmark BSE Sensex jumped by 311.22 points to close the day at 25,764.78. In the last three days, the barometer index shed more than 930 points on worries over economic crisis in China and its impact on world growth. The country’s premier index closed at 25,453.56 points on Thursday, its lowest level since August 8, 2014. Value-buying in recently beaten-down stocks and rise in US markets helped the bourses to recover from the yearly-lows on Thursday. 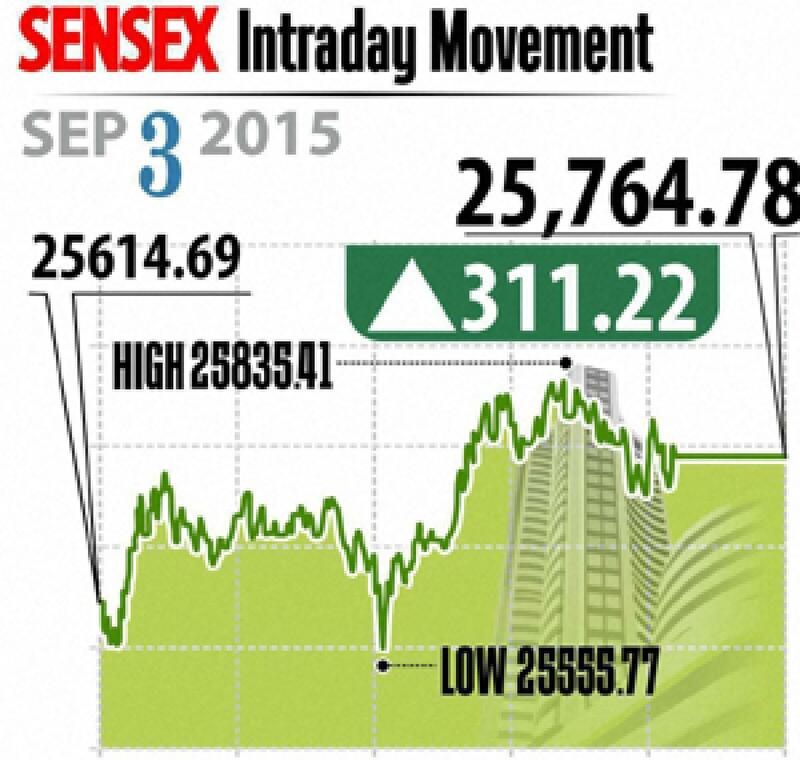 The BSE 30-share Sensex opened higher at 25,614.69 before hitting the day's high of 25,835.41. It fell to an intraday low of 25,555.77 and finally closed at 25,764.78, a rise of 311.22 points or 1.22 per cent. The broad-based NSE Nifty climbed by 106 points or 1.37 per cent to close at 7,823. Intra-day, it touched a high of 7,845.60 and low of 7,754.05. In line with overall trend, mid- and small-cap indices too ended in positive zone, gaining up to 1.18 per cent. Among Sensex members, Tata Steel was the top gainer with 4.55 per cent upswing followed by Vedanta 4.42 per cent as metal prices recovered in global markets. Shares of realty firm DLF extended its Wednesday's run-up by rising by 10.08 per cent to Rs 120.65 after it sold about 50 per cent stake each in two upcoming projects in New Delhi to Singapore's sovereign wealth fund GIC for Rs 1,990 crore. Asian stocks closed higher with Japan's Nikkei ending 0.48 per cent higher, while Chinese and Hong Kong markets remained closed for a public holiday. European markets were too higher in late morning deals.